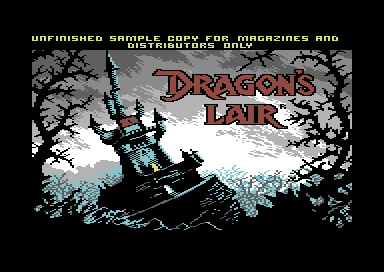 A massive thank you to Tom Roger Skauen, who passed on a copy of this very obscure and rare sample release of Dragon’s Lair – which he fully preserved in TAP format. Tom cannot remember how he obtained the game, but was probably in some kind of package deal. The tape data is different, so there was the possibility of differences to the final game – however, contributor Hank (see comments) has confirmed that apart from the loading screen – the game is identical. Possibly there are some minor bugs, but its essentially the same game. The only major difference is that the game ends at the Falling Disc 2 stage and has no further levels to load or ending. So it is really a unfinished sample like it says! This entry was posted in Commodore 64, GTW64 news, Prototype. Bookmark the permalink. Played it through. Side 1 and Side 2 are the same. Game seems to fail to load the Chessboard stage, so the end of Falling Disc 2 is as far as you can get. One of the single screen QTE stages seems ever so slightly more glitchy than the original (sprite or two out of place) but the finished game was glitchy as all hell anyway so I may be wrong. Otherwise what’s there is pretty much accurate to the actual release.